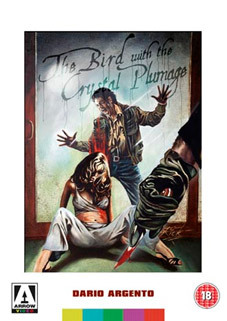 The directorial debut of one Dario Argento, The Bird With The Crystal Plumage sees the Italian master of terror drawing up a blueprint for cinematic Giallo with a brutal thriller that packs a gory brace of horrific murders alongside its genre defining mix of red herrings, leather gloved slashers and stylish decor. When Sam, an American writer living in Rome, witnesses an attempted murder in an art gallery and reports the crime to the police, he unwittingly sets the killer's sights on himself and his beautiful model girlfriend. Things soon start to unravel as it becomes clear that, with the identity of the villain very much open to question, Sam himself is a prime suspect in the case. As the murders continue, Sam begins his own investigations into the serial killings hoping to somehow clear his name. But in doing so he becomes involved in a deadly relationship with the unknown slayer. Starring Tony Musante (We Own The Night; Traffic; The Yards) and Suzy Kendall (Torso; Spasmo), and boasting music by award winning composer Ennio Morricone and cinematography by three-time Oscar winner Vittorio Storaro, Argento's groundbreaking shocker combines eye-popping visuals with a seamy vein of sadomasochism and a lust for violence to create a genre-defining movie classic. The Bird With The Crystal Plumage (cert. 15) will be released on Blu-ray by who else but Arrow Video on 23rd May 2011 at the RRP of £19.99.